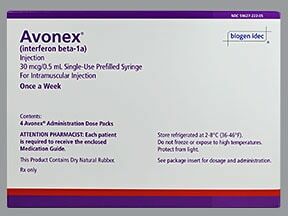 What conditions does Avonex Syringe Kit treat? Tell your doctor right away if you have any serious side effects, including: mental/mood changes (such as new or worsening depression, thoughts of suicide, psychosis), feeling too hot or cold (more than others around you), blue fingers/toes, unusual tiredness, gradual change in weight (without a change in diet or exercise), easy bleeding/bruising, pus or change in skin color at the injection site, swelling ankles/feet, joint pain/swelling, signs of kidney problems (such as a change in the amount of urine), signs of liver problems (such as nausea/vomiting that doesn't stop, loss of appetite, stomach/abdominal pain, yellowing eyes/skin, dark urine). 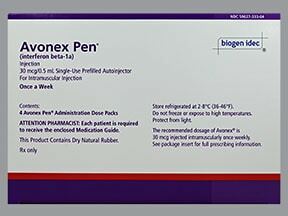 List Avonex Syringe Kit side effects by likelihood and severity. Before using this medication, tell your doctor or pharmacist your medical history, especially of: bleeding/blood problems, heart problems (such as heart failure, angina, fast/irregular heartbeat), liver disease, mental/mood disorders (such as depression, psychosis, suicidal thoughts), seizure disorder, thyroid disease. Tell your doctor if you are pregnant or plan to become pregnant. You should not become pregnant while using interferon. Interferon may harm an unborn baby. If you become pregnant, talk to your doctor right away about the risks and benefits of this medication. What should I know regarding pregnancy, nursing and administering Avonex Syringe Kit to children or the elderly? 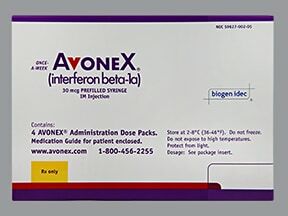 Does Avonex Syringe Kit interact with other medications? Are you taking Avonex Syringe Kit? Are you considering switching to Avonex Syringe Kit? How long have you been taking Avonex Syringe Kit?